jalada Fractal is your gate into the fantastic and mysterious world of fractal geometry. It's like you're flying into a fractal. Swipe your touch-pad to zoom into the fractal in one fluid, continuous motion. Or click and drag the mouse onto the fractal you're investigate to find your way through the beautiful complexity of fractal images. Initially, just play around. If you make a change you don't like, just step back. 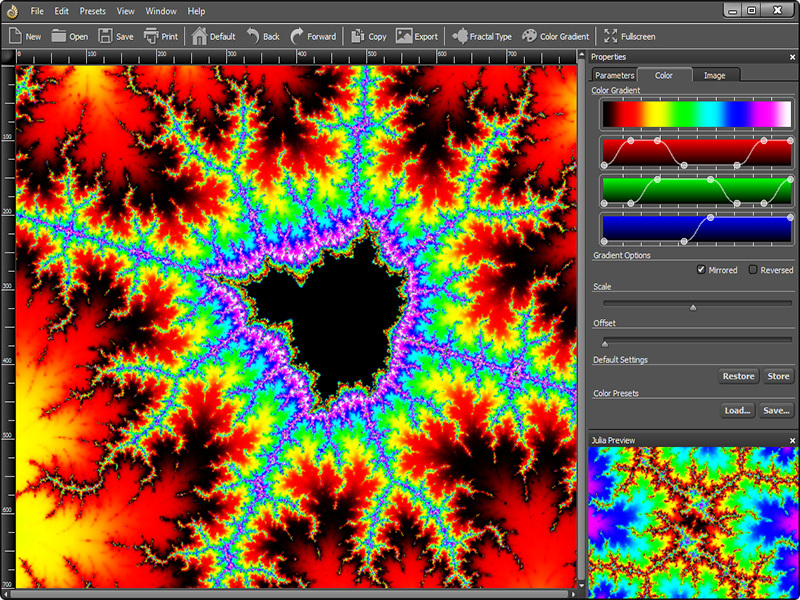 jalada Fractal is a whole fractal creation studio right inside your Computer - complete with navigation in real-time, manipulation of formulas, various coloring methods for smooth gradients, easily use of Julia and Madelbrot sets, unlimited deep zooming, free output size. The beautiful and intuitive interface makes it easy to learn, make, and create stunning art. And you can share your creations worldwide with just a few clicks. It's never been easier to make art like an pro. Even if you've never be a mathematicians. Get started quickly with a great collection of ready to use fractals from our web gallery. Using your Computer and jalada Fractal, you'll be able to see for yourself what a fractal is and how it is created. Whether you're a first-time fractal adventurer or have a Ph.D. in Mathematics, we invite you to join this exploration. Start your journey and have fun. Requisiti di sistema: Internet connection for documentation and online services.